Susan Foster, lover of coffee and flowers, works in the Center for Enrollment Services as an enrollment services specialist. Foster has worked at Cazenovia College for six years. She works hard to get seniors ready for graduation by evaluating students' degree audits, making sure the right names are on the diploma and much more, as well as help other students with their enrollment questions. She explains, "No two days are the same, which is one of the things I like." The office is fast-paced with ongoing foot traffic. Foster enjoys working with a team of hard workers and building relationships with students, coworkers, and parents. She still keeps in touch with students that she worked with who have graduated. "I had a student text me at about 12:30 a.m. on New Year's Eve to wish me a Happy New Year. That just meant so much!" Along with building relationships with people, Foster enjoys being outdoors and working in her garden or lying by the pool in the spring. She is like most college students in that she needs her morning coffee to function. "I have become one of those people that I have to have coffee as soon as my feet hit the floor." Foster is also a mother of two. She has a daughter, who is a junior at a college in Massachusetts, and a black-haired Shitzu named Moose. Foster found out later in life that she had a passion for teaching. Even though she is not a teacher, she explains that working in Enrollment Services allows her to build relationships with students without having to assign them homework. 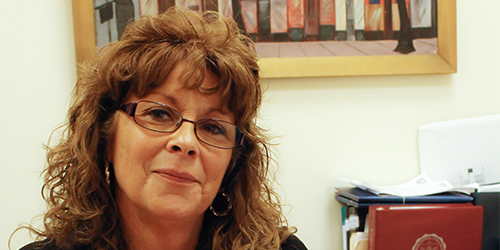 Working in Enrollment Services has been a big part of her life and she encourages everyone to stop by to say "Hello."